What causes the swarm of giant sharks near Mexico in summer? Every summer, over a hundred of the biggest sharks in the world jam into an area the size of a football field just off the coast of the Yucutan peninsula. Now scientists think they know why. Whale sharks are the biggest sharks in the world, and the biggest fish in the world, and in summer they head over to Mexico to celebrate that fact. Their appearance isn't much cause for concern for swimmers, since like many of their namesakes they eat mainly plankton. Occasionally they supplement their diet with small fish, but even though a small human could fit inside their mouths while standing up, they have no taste for human flesh. Divers hitch a ride on their dorsal fins and the only real danger they pose is the possibility of their powerful tails knocking against someone. A hit, even in passing, from the tail of a forty foot long shark is painful. Which is why people have to keep an eye out if they're diving in the clear waters near the Yucutan peninsula. Whale sharks sometimes gather here for an 'afuera' - a huge gathering. Most of the time, they're spread out across hundreds of miles of murky, nutrient-rich ocean water, but once in a while they gather together in groups in perfectly clear water. Clear water usually means dead water. When humpback whales go to the tropics to birth their calves, they stop feeding for months. It's only when they get back to colder, darker waters at the poles that they can eat again. The gathering of many huge sharks, which need a lot of fuel to keep swimming, in clear water was a mystery. The first clue came when people noticed that these sharks all pushed their mouths to the surface of the water. Researchers looked into the fish spawning off the coast of Mexico that time of year, and found the little tunny. These are relatively small tuna, only getting up to about 35 pounds. These fish group together in big schools and produce very small, clear eggs that float on water. Sometimes these eggs are pushed together in large patches by the ocean currents. Whale sharks seem to have developed a taste for tunny eggs, and swarm to them, even if it means bumping fins with many other whale sharks all after the same prize. 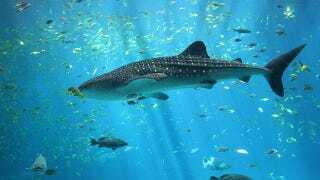 Under the right conditions, the whale sharks get together in groups of over a hundred. Those visiting the area, at the right time of year, can actually take 'whale watching' type cruises to chase down such a gathering. Just try not to fall in the water.